The Cleveland Browns hold two first-round draft picks in Thursday night’s NFL Draft. Brady Quinn, the surprise first-round pick from 2007. Today we take a look at the old cowboy, Brandon Weeden. In the spring of 2012 the Cleveland Browns once again found themselves in an all-too-familiar situation – they needed a quarterback. After trying to win with an over-the-hill Jake Delhomme, a career backup in Seneca Wallace, and a not-ready-for-the-NFL player in Colt McCoy, the Browns needed to do something and, with two picks in the first round, seemed primed to solve the quarterback problem for the next decade. The Indianapolis Colts held the first pick and had no intention of trading away their chance to replace Peyton Manning. St. Louis, at No. 2, was interested in dealing as they were saddled with Sam Bradford and his $50 million in guaranteed money at quarterback. After being unable/unwilling to beat Washington’s offer to St. Louis (one that landed the Redskins Robert Griffin III but not Griffin’s right ACL), the Browns ultimately made their move (well, former team president Mike Holmgren reportedly made his move) late in the first round and selected Brandon Weeden out of Oklahoma State. Weeden brought with him 15 school records after throwing for 9,260 yards and 75 touchdowns during his time in Stillwater. There were also questions because Weeden was 28; many draft experts said he would have been ranked higher if he was 22. Weeden was named the starter for the season opener in 2012 and hit Mohamed Massaquoi with a 24-yard pass on his first offensive series. 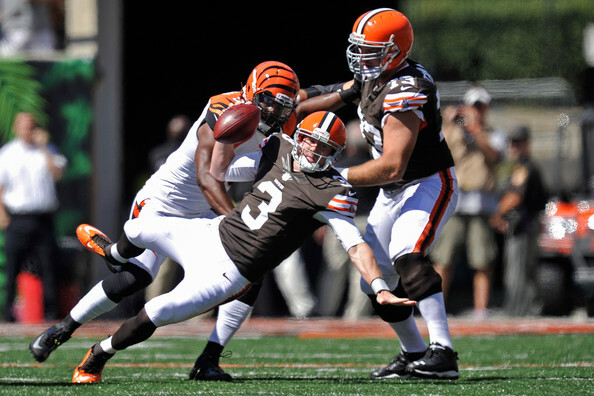 That was about the end of the good times for Weeden in Cleveland. Weeden would finish his first NFL game with just 118 passing yards, two fumbles and four interceptions. He started 15 games his rookie season, posting a 5-10 record in head coach Pat Shurmer’s second (and final) year in charge. Like many fans, we were willing to give Weeden a second chance in 2013, believing that if there was anything at all there, it would be revealed in Norv Turner’s offense. Weeden threw three interceptions in the opener against Miami, however, and lost his job after a Week 2 loss at Baltimore. He had one last good time, coming off the bench against Buffalo in Week 5 to rally the Browns past the Bills after Brian Hoyer went down with a season-ending injury. But after that, Weeden reverted to his usual self and bounced in an out of the lineup with quarterback Jason Campbell. The Browns released Weeden in the off-season. He finished his Browns career with a 5-15 record, just 23 touchdown passes against 26 interceptions and 12 fumbles, and a quarterback rating of 71.8. And more head-scratching plays than we care to remember. We could go on, but the memories are still so fresh, why put everyone through the pain? With the release of Weeden, the Browns renewed their never-ending quest for a new quarterback, a quest that may finally come to an end Thursday night in New York City. Next time: What we learned and what it means.